This EA has been developed for DAX (DE.30) M30 and is based on breakout of the Highest channel after some period of consolidation. It uses Stop pending orders with ATR Stop Loss and Take Profit. In this strategy we are limiting signals from 8:30 am to 9:30 pm. At 9:30 pm we are closing trading every Friday to prevent from weekly gaps. !! !Adjust these times to your broker time. Preset values are for UTC+1 only!!! 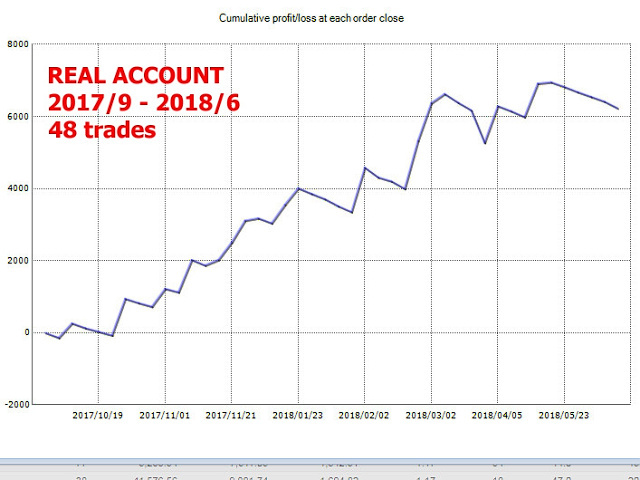 For every candle the pending orders are modified to adapt the market behavior. Everything is already set up for DAX M30. You need to set only the lotsize depending on the amount of capital in relation to the expected risk. !! 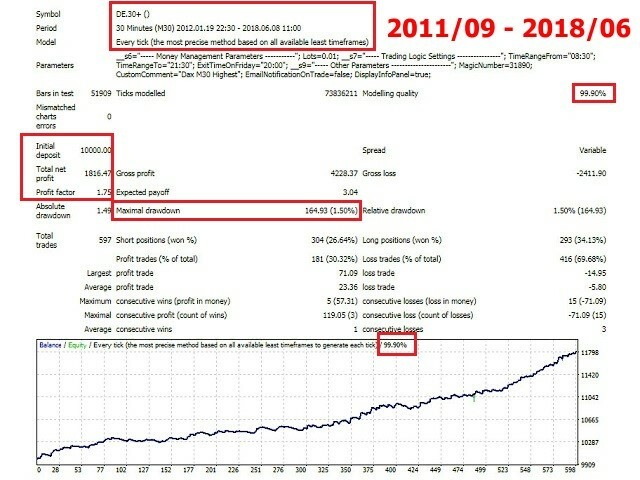 !Strategy is suitable only for brokers without pre-market!!! 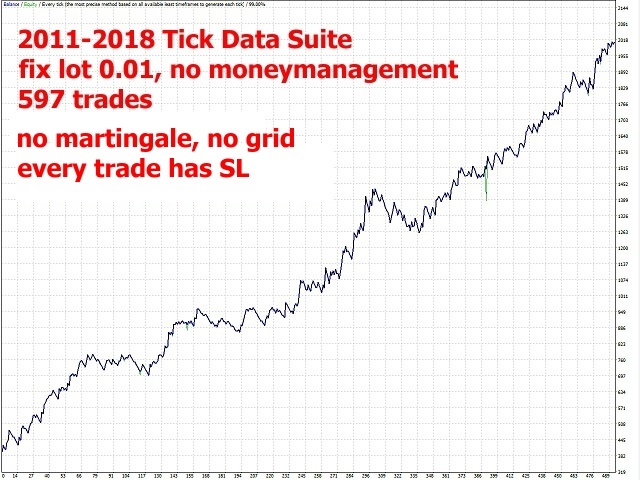 The EA has been backtested on more than 7-year long tick data with 99% quality of modeling and verified on long term futures data. There is no need to set up parameters, all settings are already optimized and fine-tuned. Test on another market to verify the edge. Test on lower and higher timeframe. 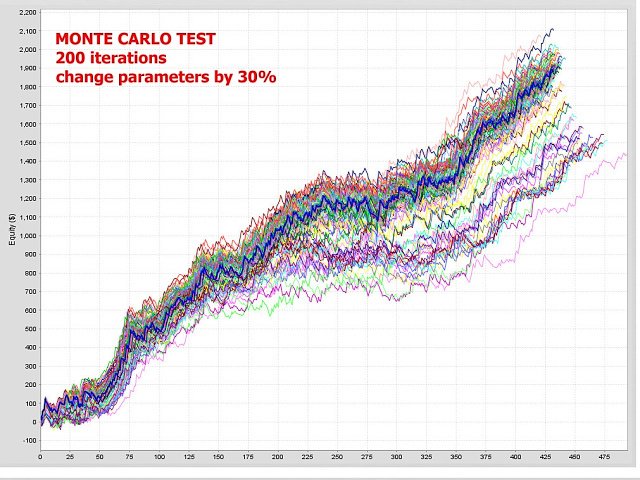 Monte Carlo simulations of Randomize trades order. Randomize history data - volatility change. Sensitivity for spread and slippage. Walk forward matrix - verify how the strategy is adaptable to a big range of market conditions. My recommendation is to have a look at the rest of my products, because the benefits of portfolio are diversification through the markets, timeframes, etc. Portfolio of strategies works better together in combination. A broker with a small spread and slippage is recommended for better performance. There is no need to use a large account. Each trade is protected by Stop Loss. No martingale, no grid, no scalp, no hedge, no latency, no arbitrage. No excessive consumption of CPU resources. If you have any questions, please contact me before buying. Lots = 0.01 - set current lot size, adjust by your capital size. TimeRangeFrom = 08.30 - start time from where the signals will be traded. This time is UTC+1, adjust this time by your broker timezone. TimeRangeTo = 21.30 - end time from where the signals and trades will be deleted. This time is UTC+1, adjust this time by your broker timezone. ExitTimeOnFriday = 20.00 - every trade will be closed at this time every Friday to prevent weekly gaps. This time is UTC+1, adjust this time by your broker timezone. MagicNumber = 31890 - trade ID. CustomComment = Dax M30 Highest - custom comment in history. EmailNotificationOnTrade = false - if a trade is opened, an email is sent to you; you need to setup an SMTP server in MetaTrader 4. DisplayInfoPanel = true - enable or disable the info panel on the chart.